- EXPERT, PROFESSIONAL ENGLISH COACH: MORE THAN 8,500 HOURS TAUGHT ON AND OFFLINE TO ADULTS SINCE 2003. STARTED TEACHING ONLINE IN 2010 BEFORE VERBLING EVEN EXISTED. GET IN TOUCH TODAY AND YOU WILL SEE HOW YOUR ENGLISH WILL NEVER BE THE SAME AGAIN. What can I say? I just love what I do! And I’ve done it since 2003! And my students seem to love me since many keep coming back! Whilst I'm new on Verbling, don't let this put you off. I've taught more than 8,000 hours to many happy students from different backgrounds some of whom I've had since 2007. Anyhow, my goal is to make your English much better in a quick, fun and easy way whatever your objective! I’ve been the main reason why students from countries such as France, Spain, Saudi Arabia, China, Peru, Ecuador or Switzerland have achieved and surpassed their English goals. If I’m still doing it after all these years I guess it means I’m a great teacher but that is for your to judge with a free trial! I grew up on an island in England and have lived in 7 countries. I have lived in Ecuador since 2011. I have a friendly and relaxed teaching style, yet it is also critical for my students to significantly improve in every class and have fun as much as possible! As I get to know you better I adapt the material more to your interests and your personality! I want you to enjoy and feel good about speaking English. I want you to have more confidence, more fluency, more precision, more vocabulary, improved pronunciation and more fun! I want to eliminate grammar as much as possible and I do this by concentrating and eliminating your common errors. I don't want to give you boring grammar classes. The goal is a light dosis of grammar. Afterall, you can study grammar in your own time. I guide what grammar you should study since you don't need to know everything about English grammar to attain a high level! Over the years I’ve taught around 8,000 hours (online and offline) to groups, to businesses, to the Official School of Languages in Spain, to adult professionals, to adolescents and civil servant English teachers in Spain! … hey I’ve even taken clients hiking for the day so they can spend the whole day speaking English. In addition, I’ve had students stay with me for a week in England so they can change their lives for ever in terms of their English ability. Furthermore, I actually personally visit some clients if I am in their country. These students typically invite me to dinner, let me stay at their house or show their city to me in exchange for free English. They even let me visit with my wife! I guess I must be doing something good for them to do this! I understand my income and my family depends on the quality of the classes I offer so my commitment is to be better than any teacher you’ve had before and always look to improve my service to you. One of the ways I do this is to ask the student if I am on the right track. Feedback, positive or negative is always welcomed! So try my classes for free! Take a no obligation free trial so you can see for yourself how good I am. This is a chance to check out the method and explain your objectives and requirements e.g. improve fluency, confidence and eliminate common errors. I offer a unique and personalised teaching method to satisfy individual student requirements whether that be an English exam (Cambridge, Trinity, IELTS, TOEFL, EOI...), an interview in English, medical or business English or general English conversation. If you have grammar doubts or need a quick correction to a phrase for an email, you can send me a message on verbling when you want and I will respond in quick time! You don't like studying grammar? No problem! With me, you will study grammar lightly to ensure you enjoy the English classes. On the whole, I look at grammar only when errors are made during conversation. The amount of grammar studied will of course depend on your level. Being that I speak French and Spanish fluently, I know better than most what it takes to learn a language and the problems you may endure. I will help you overcome those issues in a way you have never experienced before. This is better than a TEFL certificate. This shows a deep linguistic capability and critical thinking ability. My method is about correcting your common errors. A language is too complex to be studying all the grammar. For homework you will get a list of mistakes you have made in the class to be corrected for next time. I encourage you to converse as much as possible and be yourself. I often personally visit students if I am in their country. Then you would get to speak English for free over coffee or a meal for example. This book was designed to help Spanish speakers learn more effectively and more quickly. It is called 101 common errors Spaniards make when speaking English. I include excerpts of the grammar from this book in every class to ensure you are progressing every class with your grammar knowledge! My first degree was a business degree and I have professional experience in banking, tourism, and the property industry. I can help with interviews, CV/resumes, meetings, sales and marketing, negotiations, emailing and the like! I have run this for years and it is still going strong! It’s difficult to give a decent impression of my service here so please have the courage to contact me today! I would love to meet you! "Tengo 42 años y he estado estudiando ingles toda mi vida, clases particulares, academia de inglés, cursos online, inmersión en UK, etc... Hace dos meses empecé las clases de inglés vía Skype con Mark. Al principio fue duro, en lugar de avanzar tenía la sensación de retroceder pero, sorprendentemente, varias semanas después la mejora empezó a ser impresionante. Los errores escritos y orales empezaron a disminuir, mi fluidez oral y escrita mejoró pero el mayor logro ha sido en la comprensión oral. Nuestras clases son fluidas y mi dificultad de entender a Mark es prácticamente 0. Además, el 99% de mi trabajo es en inglés. Hasta ahora tenía que esforzarme enormemente para poder seguir las conversaciones. Desde hace dos semanas mi nivel de comprensión ha aumentado considerablemente y me siento mucho más cómoda y relajada". "En resumen, estoy encantada con el sistema, en mi caso los resultados han sido visibles a muy corto plazo. Además, me gustaría destacar la comodidad que supone realizar las clases en casa, así como la flexibilidad de horario. Awesome!!!" 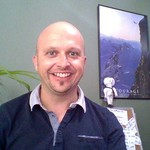 "I am grateful for having done an English online course with Mark and I totally recommend him. Today my English is a lot more fluent and I have certainly noted a big difference in my communication when I am abroad. One of the main qualities of my native teacher was the personal focus and Mark definitely knew what we had to concentrate on so I could make big progress in little time"
Please note, I don´t teach beginner levels (A1-A2). I do pre-intermediate or above (B1, B2, C1, C2). I studied French and Norwegian to English, my native tongue. The domains covered included economic, business, legal, scientific and technical translation. Worked with computer-assisted translation software and state-of-the-art corpus tools and resources. Equally important, Iearned business requirements so that I acquired the necessary project management and entrepreneurial skills to work as an English teacher. Business and tourism degree with French. Got me on the road to languages! Online language school I developed myself to teach to Spanish students via Skype. It is successful since I have had to recruit other teachers to help out. Teaching Spanish individuals and companies English in order to achieve a wide variety of goals such as passing interviews, passing exams (EOI, Cambridge, IELTS...), improving conversational English, Business English etc. I even taught civil servant English teachers. I also took some students hiking for the day so they would get more of a chance to practice their English. Volunteered for 1 week to assist with Spaniards´ English language learning in hamlet in Soria, Spain. We lived with the students for 1 week. Course to get initiated into English teaching to foreigners and to learn the grammar basics of English. Helped to get my first jobs! Due to technological advances, will learning a language be a waste of time? ¿Como puedes mejorar tu inglés? Mira abajo para saber más!